Playing off of 80s nostalgia, 2012 Topps Archives Baseball has an autograph lineup that harkens back to the days when Michael Jackson and Madonna were the world's biggest pop stars, John Hughes struck a chord with young adults and the Yankees couldn't win a World Series. Featuring a mix of old school designs and players, the 2012 Topps Archives autographs are divided into two main groups: Fan Favorites and Framed 83 Minis, which use the classic 1983 Topps Baseball design. 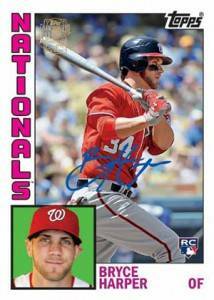 Collectors can also hunt for special autographs of Bryce Harper (1984 Topps Baseball design), Yu Darvish (1986 Topps Baseball ) and the late Gary Carter (1975 Topps Baseball). 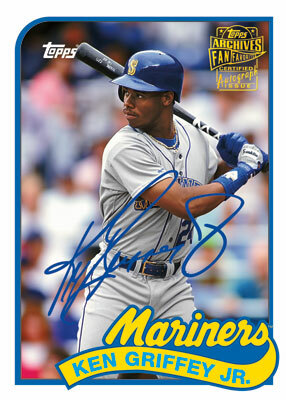 Along with the expansive autographs programs, 2012 Topps Archives Baseball has several other autographs. 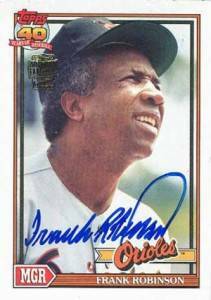 Hall of Famer Frank Robinson signed 88 buybacks. 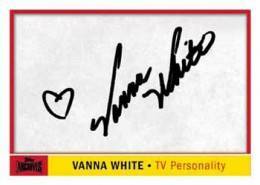 A total of 50 80s Cut-Sig Icons offer cut signatures from the likes of Vanna White, Bob Barker and James Earl Jones. 2012 Topps Archives Baseball also has three different box topper autographs randomly inserted. 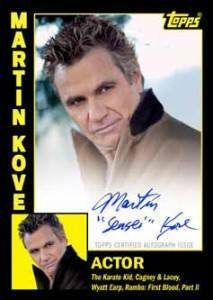 Martin Kove and Billy Zabka, both best known for their villainous roles in The Karate Kid, have signed cards inspired by 1984 Topps Baseball. 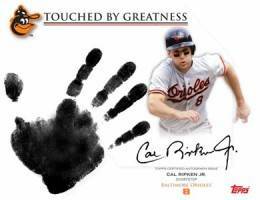 Finally, Touched by Greatness are over-sized cards featuring not only a Cal Ripken Jr. autograph, but a hand print as well. 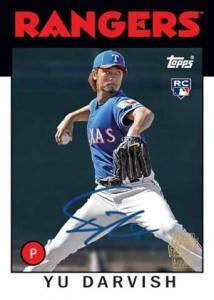 Although not cards, Topps is also inserting 100 original Topps player contracts into sealed cases. Many not only come with the player's autograph but the signature from hobby legend, Sy Berger. 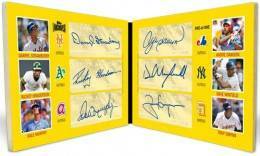 10 1/1 book cards featuring six autographs. 50 cards including Bob Barker, James Earl Jones and Vanna White. What Team has the Most Autos and what team has the relics?? Lee Champion (ID 42307) � The checklist on this page has the autograph teams listed. Relics are also listed, although not the teams.